Hello, September. 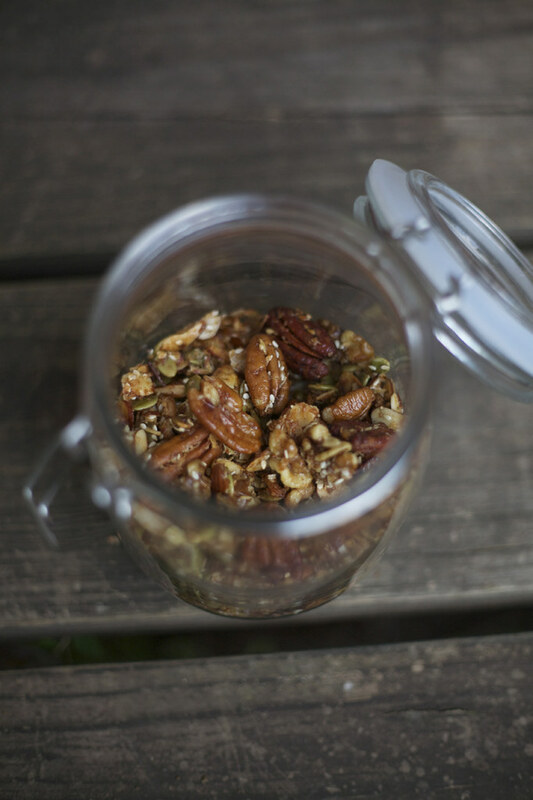 I can't believe it's already here :) Since the first day of fall is just a few weeks away, I thought I'd share this spiced granola. It's super simple and quick to make, not to mention lighter and less sweet than typical granola. It's just nuts, seeds, dates, coconut, coconut oil, and honey. You can use whatever nuts and seeds you like, and tweak the spices to your own tastes. It can also easily be made raw by using a dehydrator instead of baking it. The options are endless! Preheat oven to 350 degrees. 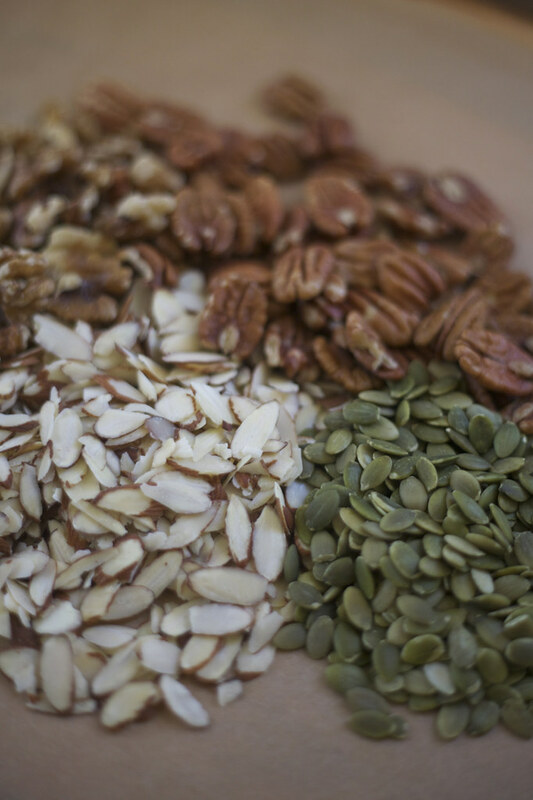 Place all the nuts, seeds, and coconut in a large bowl. In a separate bowl, mix the honey coconut oil, cinnamon, salt, cloves, and scraped vanilla bean. Pour over the nut mixture, making sure that they're evenly coated. Spread on a baking sheet and bake for 20-25 minutes, checking often. Let cool, before breaking into clusters, adding the chopped dates, and storing in an airtight container. Looks delicious! I like all of your recipes und photos, they are beautiful! 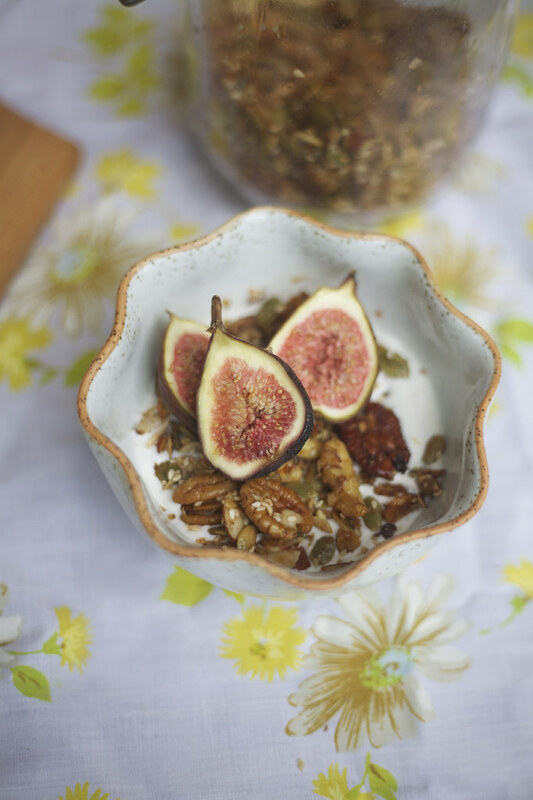 This granola is beautiful! Lovely pictures and recipe! This sounds wonderful ! I love the way it looks with the sliced figs. Thank you for sharing the recipe. I love your blog ! Wow, this is just amazing! I've been looking for a new version of my good old granola. I still love the one I make with oats or spelt, but I can use something different. Thank you! Beautiful photos by the way..